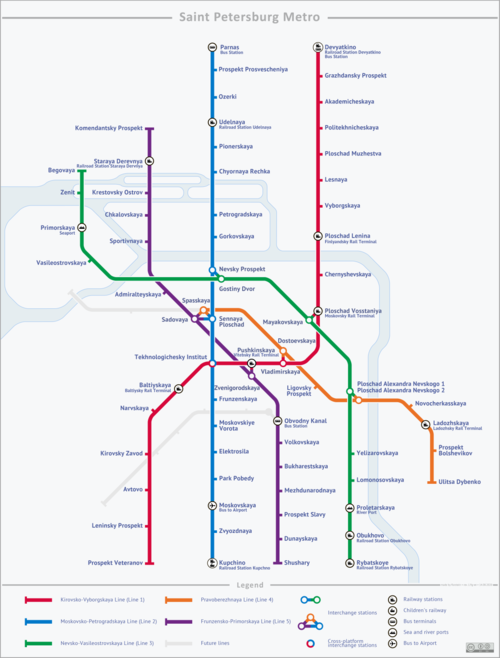 Saint Petersburg Metro is the rapid transit system in the city of Saint Petersburg and Leningrad Oblast (Province) in Russia. It opened on 15 November 1955. This metro is a combination of strong transport system and beautiful stations with expensive decorations. It is a good addition to the historic image of the city. There are 5 metro lines and 67 stations. 2-3 million people use it every day. This page was last changed on 10 March 2013, at 10:04.